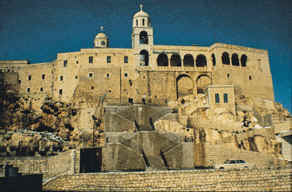 The Saidnaya Convent is located in the mountains 20 miles north the city of Damascus in Syria. Saidnaya was the seat of the ancient Patriarchate of Antioch. Saidnaya has many ancient associations with the Holy Bible. Many scholars consider Saidnaya to be second in religous importance to Jerusalem. Pilgrims from all over the world seek Saidnaya for renewal of faith and for healing. Saidnaya is also an area renowned for its faithfulness to Christianity. In past times when many cities and villages in Syria apostatized from Christianity, Saidnaya always remained a zealous defender of Christianity. The convent rises above the town like a veritable fortress and is dedicated to the Nativity of the Most Holy Theotokos. One may not enter the small chapel without removing one's sandals; inside, the walls are covered with myriad signs of gratitude to the All-pure One. The Icon of the All-holy Virgin is believed to be one of four icons extant that were painted by St. Luke the Evangelist himself. In the Syriac language this icon is called the Chahoura or Chaghoura, which means "The Illustrious, Celebrated, or Renowned." The word is a loan-word from the Arabic Chahira or El-Mashhura which have the same meaning. There are also many other fine icons of the Holy Virgin and the saints, which date from the fifth, sixth, and seventh centuries. There are about fifty nuns in the convent, presided over by an abbess. The convent owns several inalienable properties in Syria and Lebanon. Thousands of pilgrims from all parts of the world visit this holy place every year, particularly for its feast, the Nativity of the Theotokos on the eighth of September. In its library, which contains hundreds of valuable manuscripts, it can be documented that the convent was founded about the year 547. It is said that Justinian I, Emperor of Byzantium, while crossing Syria with his troops either on his way to the Holy Land or on a campaign against the Persians, came to this desert, where his army encamped and soon suffered thirst for lack of water. When they despaired, the emperor saw a beautiful gazelle off in the distance. He vigorously gave chase, hunting the animal until it tired and stopped on a rocky knoll and approached a spring of fresh water, but without giving the emperor the opportunity to shoot it. Suddenly, it transformed into an icon of the Most-holy Theotokos, which shone with a brilliant light. A white hand stretched forth from it and a voice said, "No, thou shalt not kill me, Justinian, but thou shalt build a church for me here on this hill." Then the strange heavenly light and majestic figure disappeared. Upon his return, Justinian related what he had seen to his subordinates and ordered them immediately to draw up a plan for the contemplated church. After some time had passed and the architects were unable to resolve the problems of the plan, the Holy Virgin — the gazelle — reappeared to Justinian in a dream and confided a magnificent plan to him for a convent, of which she would be the Protectress. It is said that the basic structure of the convent follows this plan to this day. The convent soon gained such renown that it came to be ranked second only to Jerusalem as a place of pilgrimage, and nuns from every corner of Syria, Egypt, and other lands flocked to it. The holy Icon El Chagoura appeared many years after the convent was constructed. In the late eighth century, a certain venerable Marina was abbess of the convent, and she was widely revered for her piety and sanctity of life. It happened that a hermit monk, a Greek pilgrim from Egypt named Theodore, stopped at the convent on his way to the Holy Land. When he was leaving, Abbess Marina asked him to buy in Jerusalem a precious and fine icon of the Holy Virgin. While at Jerusalem, he utterly forgot the task entrusted to him and started on his return journey. However, when he had not gone far from the city, he was stopped short by an unfamiliar voice: "Have you not forgotten something in Jerusalem? What have you done in regard to the commission from Abbess Marina?" Monk Theodore returned at once to Jerusalem and found an icon of the Theotokos. During the journey back to the convent, he was astounded by the miracles accomplished through the icon. He and his whole caravan were ambushed by bandits, and then attacked by wild beasts. Amidst these dangers, the hermit always invoked the aid of the Holy Virgin while holding her icon, and he and all the caravan were saved from every peril. When Theodore returned to the convent, these events tempted him to keep the valuable icon for himself, and he decided to bypass Saidnaya and sail back to Egypt. However, he was unable to set sail, for such a fierce storm arose, it seemed the ship would inevitably sink. His conscience was pricked, and he quickly left the ship and returned by way of Saidnaya. After spending four days in the convent, he was again possessed by an irresistible desire to make the icon of the Mother of God his own. He apologized to the abbess, pretending that he had been unable to buy the required icon, and then he decided to leave the convent secretly. The next morning, as he was about to set out on the journey back to his own country and approached the convent gate, he was amazed to find that an invisible power barred his way, and it was as though a stone wall stood where the gate should have been. After many futile attempts, he was forced to hand the icon over to the abbess, confessing his intention. With tears of gratitude she glorified the Lord and His All-pure Mother. Since that day, the holy Icon has remained in the convent and has been the object of great veneration. Christians and Muslims from the region and from far away places seek The holy Lady of Saidnaya (Chaghoura) shrine for healing. Numerous miraculous healing stories have been reported and some of these stories are documented in writing by those who experienced it in the entrance of the holy shrine in the convent. Many other Catholic and Orthodox, Syriac Catholic, Syriac Orthodox churches and monasteries have been built in Saidnaya throughout history. There are few massive monasteries that have been built recently. These include: St. Thomas Roman Catholic Monastery, St. Estphariuos Orthodox Monastery, Cherubim Monastery and St. Ephram Monastery in Marret Saidnaya. In case you would like to contact the sisters in Our Lady of Saidnaya Convent, here is the address and phone numbers. John 13:12. So when he had washed their feet and put his garments back on and reclined at table again, he said to them, "Do you realize what I have done for you? 13 You call me 'teacher' and 'master,' and rightly so, for indeed I am 14 If I, therefore, the master and teacher, have washed your feet, you ought to wash one another's feet. 15 I have given you a model to follow, so that as I have done for you, you should also do.